To pledge allegiance to the Kingdom of God is to disavow allegiance to other powers. In particular, Jesus points out the servant / master relationship we too often enter into with our possessions. Assuming an identity as “owner”, we continue to amass physical belongings, bits of junk, really, that we neither need or (in some cases) want. We are drawn to these because of the status they afford us, ascribing a place for us in a culture of commerce and trade. The trick is this: at what point to we cease to “own” these possessions and at what point do they begin to stake an ownership claim of their own upon our hearts? What is stewardship? How do stewardship and discipleship intersect? 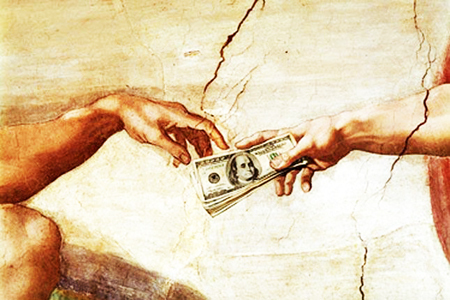 What does a healthy, God-honoring relationship to our money look like? To all of this, Jesus teaches that a house divided is no house at all. As creatures with physical and temporal limitations, we must navigate our way through a world of material dependency: food, clothing, shelter — these are vital to our flesh-and-blood existence. Yet, we maintain that these are simply accoutrements; they are not constitutive of life itself. Instead, we devote ourselves fully and wholly to the Master’s way and provision. To Him alone we pledge allegiance. This entry was posted in Discipleship, Faith, Jesus, Kingdom Values, Scripture, Sermon on the Mount, Stewardship and tagged Matthew 6.24, Sermon on the Mount, Two masters. Bookmark the permalink.